TECHNONICOL XPS 35 300 CARBON is designed for heat insulation of basements and cellars, heated floors, floors on the ground, insulation of cold bridges in panel construction. 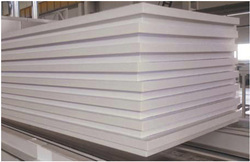 TECHNONICOL XPS 35 300 CARBON extruded polystyrene foam is a heat-insulating material with uniformly distributed closed cells. TECHNONICOL XPS 35 300 CARBON does not absorb water, does not swell or shrink, is chemically stabile, and does not decay. High strength allows to receive equal and simultaneously rigid base, and it essentially increases term of operation of the whole heat–insulating system.